Penguin Books Ltd, 1996-06-01. Paperback. Used:Good. Folio Society,, . 3 vols., 8vo., with numerous plates, maps and pedigrees; decorative cloth (orange/red/brown respectively), backstrips blocked and lettered in gilt, a near fine set in publisher's board slip-case lettered in gilt. The set comprises Byzantium. The Early Centuries; Byzantium. The Apogee; Byzantium. The Decline and Fall. Penguin Books Ltd. Hardcover. 0670823775 New Condition. . New. Penguin Books Ltd. Hardcover. 0670823775 Like New Condition. . Fine. Folio Society, 2003-01-01. Hardcover. Fine. 1989-03-18. New. Ships with Tracking Number! INTERNATIONAL WORLDWIDE Shipping available. Buy with confidence, excellent customer service! 1993-04-04. New. Ships with Tracking Number! INTERNATIONAL WORLDWIDE Shipping available. Buy with confidence, excellent customer service! 1992-04-05. New. Ships with Tracking Number! INTERNATIONAL WORLDWIDE Shipping available. Buy with confidence, excellent customer service! FOLIO SOCIETY LTD (ENGLAND). Used - Good. Shows some signs of wear, and may have some markings on the inside. NY:: Knopf,. Near Fine in Near Fine dust jacket. 1992. Hardcover. 0394537793 . First American edition. Near fine in a near fine dust jacket. ; 389 pages . London: Folio Society, 2009. Beautiful 3 volume set , Near Fine no marks, tears or other defects in a Near Fine Slip case. Set in Garamond at the Folio Society. Printed on Abby Wove paper by MemmingerPrinted and blocked with a design by Neil Packer. Sixth printing. . 6th. Hard Cover. Near Fine/Not Issued. 4to - over 9¾" - 12" tall. Folio Society. London: The Folio Society, 2003. First Edition. Hardcover. Complete set. Three volumes in slipcase. 452pp; 450pp; 537pp. Pictorial cloth. With numerous illustrations and maps. A fine set in slipcase. ; Octavo. Penguin Books Ltd, 1990-05-01. Paperback. Used:Good. Knopf. Hardcover. 0394537785 New Condition *** Right Off the Shelf | Ships within 2 Business Days ~~~ Customer Service Is Our Top Priority! - Thank you for LOOKING :-) . New. London : Viking, 1988. 1st Edition . Hardcover. Very Good/Very Good. 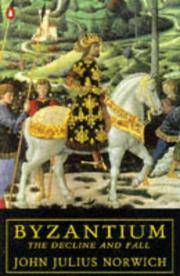 Byzantium: The Early Centuries (1988; First Edition/Second Printing; 408pp); Byzantium: The Apogee (1991; First Edition/First Printing; 389pp); and Byzantium: The Decline and Fall (1995; First Edition/Third Printing; 488pp). Three Volume Set Complete. Black cloth, gilt titles to spines. DJs entire but price clipped. Volume I has the fep cut, Volumes II and III have prior owner's names on feps blacked out. An attractive fresh set. Knopf, 1992. Hardcover. New. 9.51 x 6.5 cm. VeryGood/very Good. Complete Three Volume Set. Very good clean copies in vey good dust jackets. Illustrated. Extra postage required for international shipping: please inquire before ordering. Knopf, NY, 1989. 1st edition. Hardcover. Fine/Fine. A definive history. Detailed index. 408 pgs. Knopf. Hardcover. 0394537785 1st edition 1st printing - minor staining to page edge - otherwise dust jacket and cover fine binding strong contents clean - now in mylar cover - enjoy . Very Good. 1989-03-18. Good. Ships with Tracking Number! INTERNATIONAL WORLDWIDE Shipping available. May not contain Access Codes or Supplements. May be ex-library. Shipping & Handling by region. Buy with confidence, excellent customer service! Viking, 1988. Volume 1. This is an ex-library book and may have the usual library/used-book markings inside.This book has hardback covers. With owner's inscription inside cover. In good all round condition. Dust Jacket in good condition. Folio Society. Norwich, John Julius. Byzantium: The Apogee, The Early Centuries, The Decline and Fall (3 volumes). London: Folio Society, 2011. Indexed. Illustrated. 8vo. Book condition: Near fine with quite subtle, pale smudge on spine of third volume. . Fine. 2011. Knopf. Hardcover. 0394537785 1st edition 1st printing - some staining on dust jacket and page edge - otherwise cover fine binding strong contents clean - now in removable mylar cover - enjoy . Very Good. Knopf. Hardcover. 0394537793 New Condition *** Right Off the Shelf | Ships within 2 Business Days ~~~ Customer Service Is Our Top Priority! - Thank you for LOOKING :-) . New. Knopf. Hardcover. 0394537793 Special order direct from the distributor . New. Knopf. Hardcover. 0394537793 New Condition. . New. Viking. Hardcover. 0670802522 New Condition. . New. Random House Inc, January 1992. Hardcover Hardcover. New. Comprehensive in outline yet written for the general reader, the <i>Byzantium</i> trilogy can fill a gap that exists in most Western readers' awareness of their own heritage. We pass to the reviews: ''I am amazed by Lord Norwich's book. He is brilliant but not superficial, unflaggingly entertaining... This is popular history in the honorable sense in which Macaulay was a popular historian: an intellectual entertainment with a certain didactic edge... a sparkling single narrative with sharp observation of politics and personalities.'' -- Peter Levi, <i>The Independent</i>. ''Norwich is always on the lookout for the small but revealing details...the significant anecdote... the bizarre episode. All of this he recounts in a style that consistently entertains and sometimes sparkles, and with an unerring sense of what the modern Western reader needs to know. '' -- Jaroslav Pelikan, <i>New York Times Book Review</i>. Volume 2 of 2. New York: Alfred A. Knopf, 1996. WYSIWYG pricing--no added shipping charge for standard shipping within USA. Full peach cloth with gilt titles, xxxvii, 488 pp, 8 ff color plates, 8 ff b & w plates, 4 maps, footnotes, bibliography, index. DJ in Brodart archival cover. The third and final volume of the author's history of Byzantium, "the longest-lived [1,123 years] and most continuously inspired Christian empire...." Shipping weight 3 lbs.. First US Edition. . Fine/Fine. 24 X 17 cm. Knopf. Hardcover. 0394537793 . New. 1993-04-04. Good. Ships with Tracking Number! INTERNATIONAL WORLDWIDE Shipping available. May not contain Access Codes or Supplements. May be ex-library. Shipping & Handling by region. Buy with confidence, excellent customer service! Knopf. Hardcover. 0394537793 Minor shelf wear . Very Good. 1992-04-05. Good. Ships with Tracking Number! INTERNATIONAL WORLDWIDE Shipping available. May not contain Access Codes or Supplements. May be ex-library. Shipping & Handling by region. Buy with confidence, excellent customer service! Essais. Ausgewahlt und mit einem Nachwort von Ralph-Rainer Wuthenow. Revidierte Fassung der Ubertragung von Johann Joachim Bode. Ottobrunn bei Munchen: Franklin Bibliothek. 1983. Limited Edition. H Half-Leather. As New. No Dust Jacket, As Issued. (2) 287 (1) pp. Text in German. Limited Edition, 1983. "Salvador Dalis Illustrationen wurden 1947 zum ersten Mal in einer Ausgabe, die vom Kunstler selbst ausgewahlte Essais von Montaigne enthielt, bei Doubleday, New York veroffentlichte." No Book Plate. Pristine, no wear. Clean, tight and strong binding with no underlining, highlighting or marginalia. Brown half-leather over brown cloth with gilt embossed decorative boards, raised bands on spine, gilt lettering to spine, gilt text block edges, brown decorative endpapers, and a brown satin ribbon. Viking. Hardcover. 0670802522 Like New Condition. . Fine. Knopf. Hardcover. 0394537793 Like New Condition. . Fine. Knopf. Hardcover. 0394537793 *BRAND NEW* Ships Same Day or Next! . New. Knopf. Hardcover. 0394537793 *LIKE NEW* Ships Same Day or Next! . Fine.